2017 was a record year for Real Estate in Nashville, Tennessee. The most significant achievement was this: 40,482 residential properties were sold in Greater Nashville during the year. This is a record for Nashville that we would have to go all the way back to 2006 to beat. If that were the only achievement [and it wasn’t], then I would say that it was a great year. We also hit the record for the highest ever median sales price in December 2017. We are closing in on $300 big ones. Check it out. 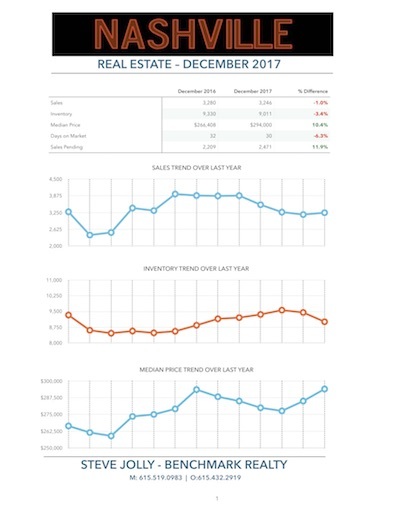 Here’s a quick look at the numbers for Nashville Real Estate at year end. Powers was not the only one bullish on the Nashville Market. Zillow has Nashville in their Top 10 Hottest Housing Markets for 2018. PwC [PricewaterhouseCoopers] puts out one of the nation’s preeminent annual publications on real estate across the nation called Emerging Trends in Real Estate. PwC has Nashville in their Top 10 U.S. Real Estate Markets to watch due to the high rates of population growth [especially from millennials], a business-friendly environment and an affordable high quality of life. Interestingly enough, they listed Nashville’s biggest challenges as transit and infrastructure. If you want a copy of any of these report, simply hit reply and I’ll gladly send them all to you. The Daily Deal in Nashville is this amazing home in Brentwood [Williamson County] with an open floor plan, great location and listed for less than $550,000.